Padlet is undoubtedly one of my all time favorite sites for student collaboration and brainstorming. 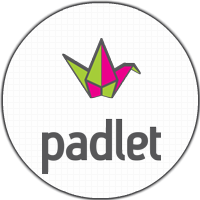 Padlet is an online bulletin board that allows teachers & students to post images, videos, documents, and text. All this can be done using the sites intuitive drag & drop interface. Padlet's best feature would have to be it's user friendliness. A teacher can literally set a wall up on the fly and have students posting to the wall in under a minute. You just need to go to www.padlet.com, click on the build a wall button, and share the link with your class. Done. Double clicking anywhere on the blank board allows collaborators to post to the board. Once the post-it note appears on the board users can attach pictures, video, and links. Photos can be posted by uploading them from a computer, linked from an existing URL, or added directly via. a computer's webcam. The Tool Icons on the Right side allows owners to access sharing options, account information, or make modifications to the current wall.